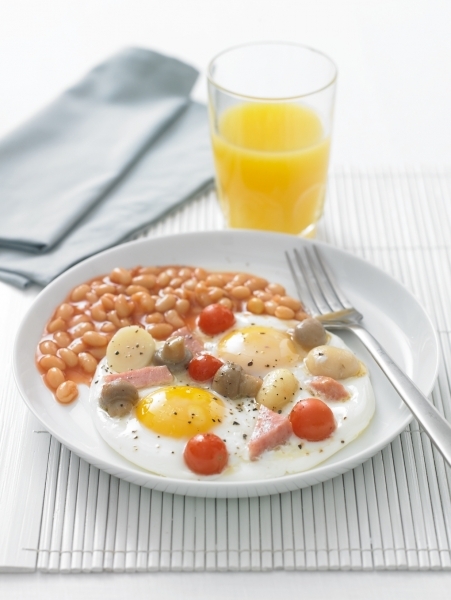 Start the day with a full English breakfast – loaded with two portions of your 5-A-DAY. 20 minutes to prepare and cook. Serves 1. 2. Heat a large frying pan and lightly drizzle with oil. 3. Slice the spam, cut into strips, add to the pan with the potato and fry gently for 2-3 minutes allowing them to colour and crisp slightly. 4. Add the mushrooms and cherry tomatoes and continue to fry for 2-3 minutes, shaking the pan occasionally. 5. Break the eggs into the pan, allow the egg white to run through the mixture, season and cook for 2-3 minutes on a low heat. 6. Put the frying pan under the grill, making sure to keep the handle away from the heat and allow the egg white to cook through for 1-2 minutes. The pan will need attending at all times. How to serve: Loosen the omelette around the edge with a palette knife and give the pan a gentle shake to release the bottom, slide the omelette onto a plate. Serve with warm baked beans. 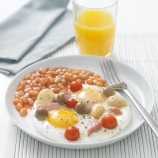 This recipe and image is copyrighted to Canned Food UK.